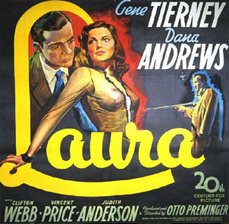 The film begins with a detective, Mark McPherson (Dana Andrews) being called in to investigate the murder of Laura Hunt (Gene Tierney), who has been brutally shot in the face at close range in the doorway of her apartment. McPherson must piece together Laura’s past by talking to her friends and colleagues, trying to figure out what kind of secret this woman must have had that meant her life would end in such a violent way. Sounds like a straightforward detective story so far, right? A little bit Raymond Chandler, a little bit Agatha Christie. It is, technically, a detective story all the way through. But you won’t realise that while watching it, because there are so many other elements at play. The thing that makes this film unique is the spell it casts over the viewer. McPherson starts getting drawn in to the mystery of Laura, and even becomes a little obsessed. He can’t stop staring at the portrait of her that hangs over the fireplace in her apartment. In the world of the film, this doesn’t seem strange, except that he’s a cop, not only becoming personally involved in the case he’s investigating, but falling in love with a dead woman. The music contributes to the dream-like, slightly sinister atmosphere. A mood of melancholy hangs over the first half of the film, and this is largely due to the refrain that is repeated in several scenes. This score was later made into a popular jazz standard, covered by people like Frank Sinatra and Nat King Cole, but it works best played over the scene where McPherson falls asleep in Laura’s apartment, tired out from trying to figure out what it is that’s so captivating about the leading lady. I’m not going to spoil what happens next, because you should all watch it, but it’s one of my favourite scenes in cinema, and it turns everything we’ve learned in the film on its head. Horror movie star Vincent Price also stars as Laura’s fiance. Laura is an incredibly atmospheric film. The low-key lighting, haunting music and a certain pivotal scene halfway through mean that it’s best watched late at night in a dark room. It’s somewhere between a film noir, a detective story and a melodrama. There are continual debates about what film noir actually is – whether it’s a style, a genre, or both – but basically it covers a bunch of films made between the early 40s and mid-50s, mostly in black and white, mostly dealing with crime and featuring gender roles which are distorted in interesting ways. The reason this isn’t quite a noir is that the titular character isn’t a femme fatale, although a man kills for her. She isn’t vindictive, more of a mystery, and by the end of the film we still don’t quite know who she is. It’s gorgeously filmed in black and white (making the best use possible of chiaroscuro lighting), while the apartment sets are lavish and fill the screen. It’s also a very short film, clocking in at 88 minutes, not a minute longer or shorter than it needs to be. Maybe the best thing about Laura, though, is that it sounds so ridiculous and contrived on paper, yet on the screen it just works. There’s something enchanting about that. This entry was posted in Film and tagged film, Hollywood. Bookmark the permalink.